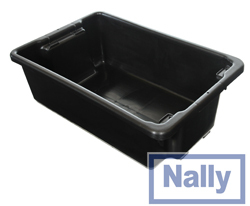 MACKAY CONTAINERS stocks a range of NALLY bins and Nally Mega bins. These bins are tough. 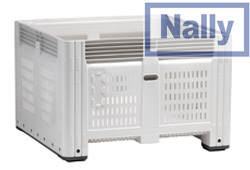 Anyone who has used these bins will tell you they last. 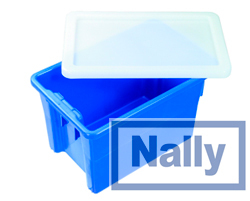 We are still using Nally Bins we bought 20 years ago while bins from the supermarkets often don't last 20 minutes. 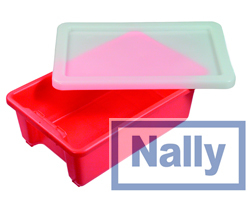 The NALLY bins come in 3 sizes and are available in either food grade polyproplene or black recycled polyproplene. Lids are available. 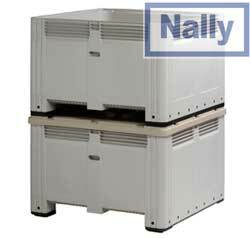 These bins can be nested when empty to save space and when full can be stacked on the floor of a container. 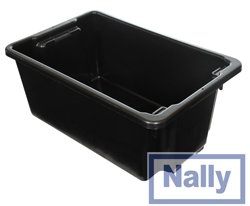 If the ABCAR longspan shelving is used in a container the NALLY bins can be used on the shelves to keep stock organised. 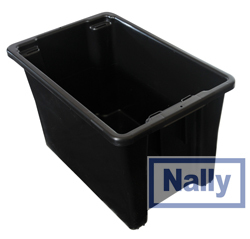 The NALLY Mega bins which are the size of a pallet come either ventilated or unventilated. Lids are availabe. They are fitted with forklift pockets for easy handling.